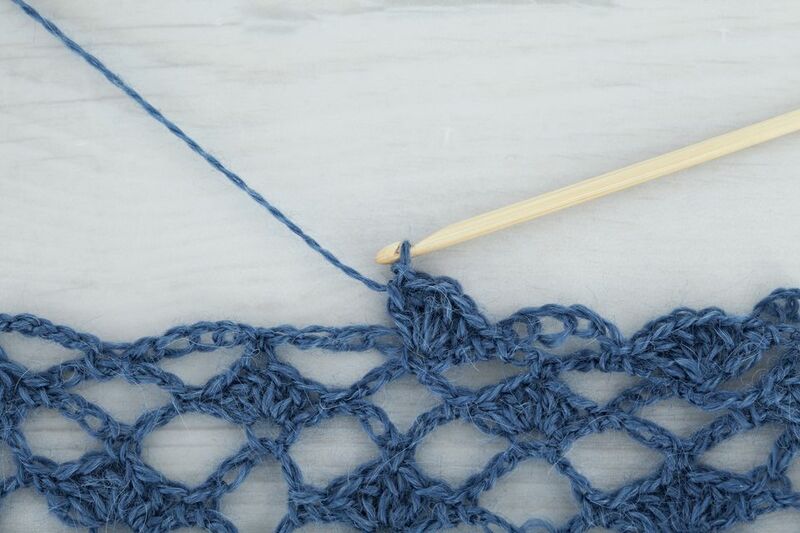 Following are photos and instructions for a stitch pattern that uses the method of skipping a stitch and later working back into that stitch with a long double crochet. This is used to form a specific textured look within a crocheted design. The guide should help you understand more about working the long double crochet stitch as well as crossing over stitches when working back and forth in slipped stitches. This technique is what you'll use when making crochet cables. Textured Long Double Crochet Stitch. Photo copyright (c) by Sandi Marshall, licensed to About.com, Inc. Starting Chain Formula: Any multiple of 4 plus 1. First Row: sc in 2nd ch from hook and in each remaining ch across the row. Row 2: ch 3 to turn, work 1 dc in each of next 3 sts, make one long dc in the first st of this row (same place as the beginning ch-3), * skip 1 st, work 1 dc in each of next 3 sts, make one long dc in the skipped stitch **, repeat the directions between * and ** as many times as needed to go across the row. Additional Rows: Repeat row 2. Scroll down this page to see a closer look at the stitches in the photos below, along with the long dc how-to. Long Double Crochet Crossover. Photo copyright 2007 by Sandi Marshall, licensed to About.com, Inc.
With the exception of the long loop that is pulled up as part of this stitch, the long double crochet is made the same way that you make a regular double crochet. Long Double Crochet How-To: Yarn over hook, insert hook through the stitch where you want the long loop to begin, then yarn over hook, pull yarn through the stitch and continue pulling to draw up a long loop that will reach over to the next stitch to be worked in the row, yarn over hook, pull through 2 loops on hook, yarn over hook, pull through last 2 loops on hook. This photo shows the start of row 2 (see beside first photo above), with a long double crochet worked as a cross-over long double crochet (with the long loop crossing over several stitches sideways). Photo copyright 2007 by Sandi Marshall, licensed to About.com, Inc. This photo shows the stitches that are worked just before doing the next cross-over double crochet stitch. You can see the skipped stitch on the right-hand side of the photo. This skipped stitch is the place that the hook will be inserted to begin the next long double crochet. Cross-Over Long Double Crochet Row 2 In Progress. Photo copyright 2007 by Sandi Marshall, licensed to About.com, Inc. This photo shows the start of row 2, with one cross-over long double crochet completed and the next one in progress. Notice that, in this stitch pattern, when you skip a stitch (right after a cross-over long dc has been made), you are skipping the stitch that would have been used by the long dc if it had been a regular dc.